APT-II Products are acrylic emulsion additives designed to enhance greenware, bisque and porcelain in many ways. APT-II is food safe and non toxic. APT-II won’t change firing methods or cones & has an indefinite shelf life. Will not leave a shiny spot after firing where it has been applied direct. Colors placed on top of APT-II adhere to the piece. APT-II doesn’t alter your usage techniques. Cleans up with water. Unbreakable dispenser bottles. Complete instructions included. APT-II Ceramic Enhancer - 2 fl. oz. 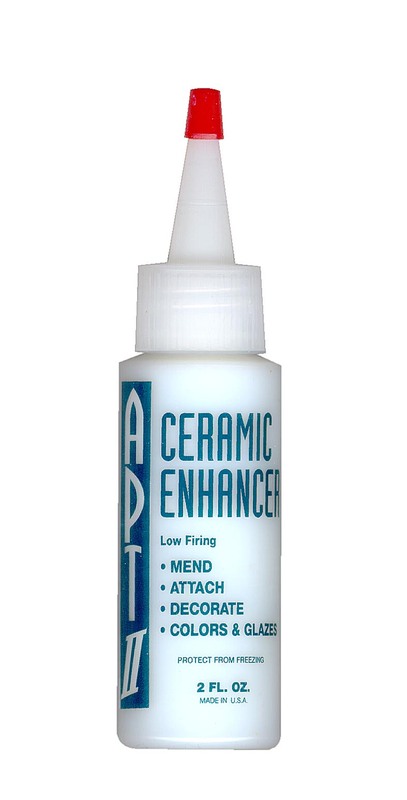 APT-II Porcelain & Stoneware Enhancer - 2 fl. oz. APT-II Mend-A-Mold - 1 fl. oz.